Blue Bloods Nov 19 S3ep8 "Higher Education"
See Walter on CBS hit. Costar Credit for role in opening scene. More to come!!! Cast as Understudy to the Male Lead, Walter wound up performing 4 of the 5 shows. See press page for reviews! 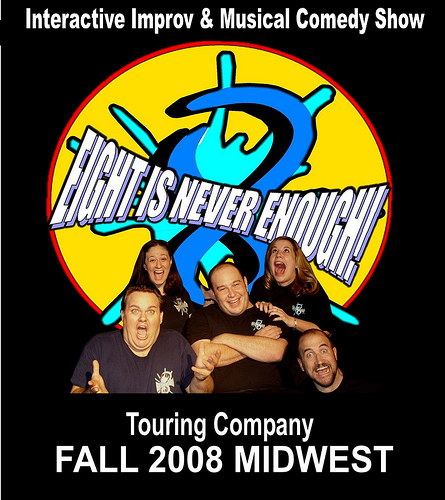 EIGHT IS NEVER ENOUGHunder the direction of Walt Frasier heads south to perform for Marines Tuesday Night and the families, as IMPROV 4 KIDS, Wednesday Morning. On June 11, 2009, Walt Frasier and company will perform original anti drunk driving show for students at William Floyd HS, Long Island. THE POWER OF NO! is now a K-5 Drug Prevention assembly program. Based on the popular educational series, IMPROV 4 KIDS has written as sketch and musical show that alternates funny characters, great music and strong clear message. Empowerment takes the popular 80s phrase SAY NO TO DRUGS/JUST SAY NO to the next level. Opening with a Rap, closing with a bluesy Rock n Roll number and complete with skits and interactive game show, the show is a must for any school trying to reach the kids on a fun level to reinforce the classroom. Walt Frasier entertains weekend warriors in Ohio.